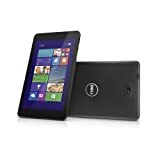 Dell Venue 8 Pro specifications, info. The Dell Venue 8 Pro offers a small-screen tablet experience with optional digitizer making it an intresting pro-level device. Baytrail-T at 1.33Ghz (quad-core) should make it faster than the Clovertrail tablets of 2012/2013 too. A great addition to the sub-10" segment. WiFI is 2x2 MIMO. 64GB eMMC storage option. $299 starting price. WWAN options: Dell Wireless 5570E (HSPA+) or Dell Wireless 5808E (4G LTE/HSPA/EVDO) Mobile Broadband (available in USA only), 10 point capacative touch. Available in Red or Black.USB port is USB 2.0. TPM Module included. Dell Venue 8 Pro news and review links.